If you ever actually read my credits, you’ll notice that junk. is a frequent flyer in my photos. Not just in the sets I build for photography; Tab Tatham and EvanKeel’s work grace my home in every room. It is not just the style of furnishings and knickknacks that draw my eye – it is the attention to detail, the fabulous textures and imaginative products that make my shabby little heart go pitty-pat-thump. The sim is a wonder for a “things” lover like me. You can easily forget that you are at a store; it is an incredible venue just for wandering and taking photos. Which I did that day…I wandered, I took photos, I squee’d at their stuff, old and new, I bought more things and had just a wonderful time. It is a fabulous destination and even more so in that you can take the pretties home with you. To celebrate their grand opening, junk. sponsored a photo contest of images of their sim. After consultation with Rwah (who was right; the original photo was too purple!) I entered the photo above. And to my shock and surprise, I won second place! It was really nice to receive cash as an award, but more importantly, I felt pride that I was able to capture the essence of Tab and Evan’s sim. Fractured dreams, broken cars and beauty among the castoffs. 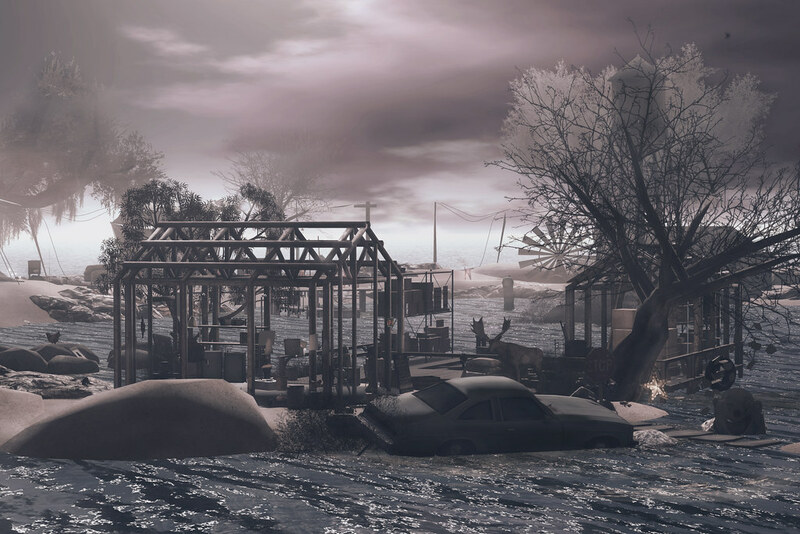 Photo Contests, Second Life Home & Gardening, Second Life Placesjunk. Thats great….congratulations Peep. (I wonder which photo got first prize). Beautiful! (You should have gotten first) Oh! and I’m sorry I “borrowed” your car and, um drove it into the water last night! Cao’s are very bad driver’s *blushes* Eyes Sorry!